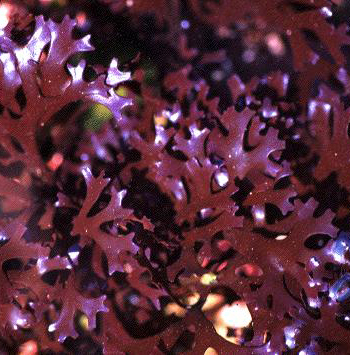 Irish moss is a purplish, edible red algae or seaweed. The plant consists of a greenish frond that turns purple when dried. Found on the rocky shores of northern Europe and North America. Grows among submerged rocks off the coast of France and naturally, Ireland. Named after Carragheen, Ireland. Irish moss, or carrageen, is a seaweed found in great abundance off the shores of Ireland on the submerged rocks. At low tide it is raked up, washed and dried in the sun, which bleaches it to a tan color. The dried moss has little odor or taste. It forms a stiff mucilage when boiled in water; contains considerable amount of sulphur and small amounts of iodine and minerals. When cooled it becomes a jelly-like substance. Cold water does not dissolve Irish moss, it swells it up. This is why it is used as bulk in the diet for promotion of bowel elimination. Used in soups, custards, puddings, cold sweets, jelly and wherever thickening is desired. Good for clarifying beer and as a base for skin creams. Considered an excellent remedy for tuberculosis and wasting diseases, coughs, bronchitis, and intestinal problems. It makes a nourishing food for those recovering from TB and other illnesses. Medicinally, it is used as a decoction. It is often combined with Iceland moss, comfrey root and honey to form a mucilage for treating the lungs, sore throat and wasting diseases. It is good for dysentery, aids in the formation of bulky stools and corrects diarrhea, and as a digestive aid; has a mild laxative property. Use for thyroid problems (goiter), swollen lymph glands, enlarged prostate glands, convalescence, debility, old age, dry skin, colon disorders, and obesity. Used for hand lotions. Burns are treated with a slave of an extract of Irish moss. Irish moss contains some crude protein, a scant trace of fat, very little sugar and carbohydrates in indigestible cellulose form; therefore, low calorie recipes prepared with this herb should be of special interest to weight watchers. Decoction: use 1 tsp. of the plant with 1 cup water. Take 1-2 cups a day. Or another recipe: boil 1/2 oz. dried moss in 1 1/2 pints of water. Boil down to 1 pint. Add lemon juice for flavor if desired. (More nutritious if boiled in milk) Before boiling in milk or water, allow the moss to soak in cold water for an hour or more to remove saline, then strain off the water.